Every time I think of this wedding, I smile. A truly lovely couple who managed to pull off a wedding that reflected their unique style and personalities, with a little help from wedding planner extraordinaire Paula Bevege. It was truly magical, it felt so much less like work and more like being part of something special. 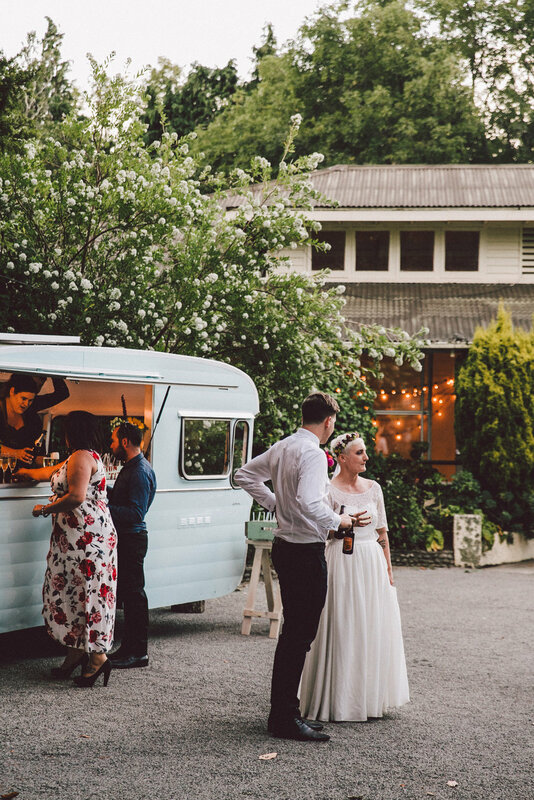 Married at Rose & Smith at Tauherenikau on a very very hot summers day, Nick & Jemma invited over 150 guests to join in their festival wedding. To picnic with them on the lawn, eat incredible food, drink Peroni & cocktails (that's where we came in) and dance the night away. The setup was amazing (so amazing in fact that this little shindig was featured in the Mr & Mrs Magazine produced by the Wellington Wedding Show team). The space is really unique. There are two large meadow areas with beautiful big shade trees, an old dining hall (not sure if that's what it's called, but that's what I call it!) which features white walls and rafters and even an old grandstand which makes for some amazing photos. Add to this foundation wildflowers in bottles literally everywhere, picnic tables, blankets and calico covered hay bales, fairy lights strung in the trees and a convoy of food trucks plus Audrey all around. Nick & Jemma grinned from ear to ear from the moment we first saw them until we left just after midnight. We are so grateful we got to be part of creating the perfect day for them and their guests.